The non-dairy whipping agents market report gives data for the estimated year 2018, and the forecast year 2026, in terms of both, value (US$) and volume (MT). The report consists of the forecast factors that affect and influence the non-dairy whipping agents market, macroeconomic factors, and market outlook of the non-dairy whipping agents market. The report also includes the drivers, trends, and restraints of the non-dairy whipping agents market. The key aspect of the report includes a detailed competitive landscape analysis, value chain analysis, strategic overview, and key players in the non-dairy whipping agents market. This gives a comprehensive overview of the non-dairy whipping agents market to the report users. The report consists of a market structure, and gives a detailed comparison between multinational players, local players, and regional players in the non-dairy whipping agents market. The study provides the market attractiveness analysis by form, application, end use, and region. The report analyses the market share of the non-dairy whipping agents on the basis of application, end use, form, and region. A section of the report highlights the region-wise demand for non-dairy whipping agents. It provides a market outlook for 2018–2026, and sets the forecast within the context of the non-dairy whipping agent’s ecosystem, including new technological developments as well as product offerings in the global non-dairy whipping agents market. 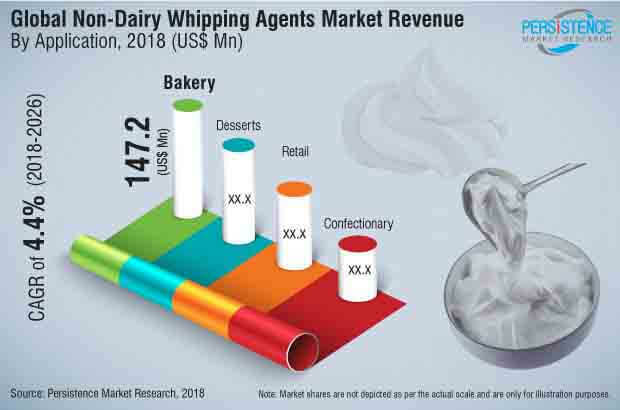 This study discusses the key regional trends contributing to the growth of the non-dairy whipping agents market, globally, as well as analyses the degree at which the drivers are influencing the non-dairy whipping agents market, globally. Key regions assessed in this report include North America, Latin America, Europe, APAC, and the Middle East & Africa. Non-dairy whipping agents are liquid formulations or spray dried powders, which when mixed with water or milk, followed by whipping, form whipped cream with a desirable texture and taste. Used in multiple verticals of the food industry such as confectionary, bakery, desserts, etc., a non-dairy whipping agent is an ingredient of high importance in the food industry. Non-dairy whipping agents are more often preferred over their dairy counterparts, owing to their cost feasibility. Non-dairy whipping agents are also highly modifiable, as they are not dependent on the dairy cream content in them for their function. Non-dairy whipping agents are also available that are derived from sources of preference, or can be tailor-made for a specific application such as for food processing or for decoration purposes. In terms of volume, the liquid form of the non-dairy whipping agents market clearly leads the way. This is due to multiple factors such as ease of availability, ease of use and storage, and availability of non-dairy whipping agents through retail sales for a wider consumer base to reach. The powder form of non-dairy whipping agents is not highly utilized as of now, but is expected to reach a marginally higher CAGR than the liquid form of non-dairy whipping agents over the forecast period. The bakery industry is expected to remain a large influence on the non-dairy whipping agents market, largely due to multiple applications of non-dairy whipping agents in bakery products. This influence of bakery products in the non-dairy whipping agents market can be attributed to Europe and North America, primarily, and secondly APAC. APAC presents itself with multiple opportunities for the growth of the non-dairy whipping agents market, since the region has multiple developing countries that have acquired a taste for Western food, and are home to a fast-moving bakery industry. The increasing demand for non-dairy whipping agents from developing countries can be observed to stem from the dairy-free movement that is gaining traction in Western culture, where consumers are shifting from dairy-based products to dairy substitutes across all food types. Manufacturers have also jumped in on this opportunity, and have been offering multiple dairy-free whipping agent alternatives based on soybean proteins, sunflower proteins, and vegetable oils instead of milk fats to attain the much sought-after dairy-free label. On the other hand, for developing regions, the cost feasible nature of non-dairy whipping agents is the appealing factor. For mass production of confectionary or processed bakery products, the cost feasibility of non-dairy whipping agents is the primary parameter for manufacturers. Even so, whipped cream manufacturers are introducing non-dairy counterparts of whipped cream products in developing regions as well; a major example of which is Rich Gravis introducing its non-dairy whipped cream in the Indian market recently to conform the requirements of the modern Indian consumers. Multiple other market players have also introduced coconut-based and palm oil-based non-dairy whipping agents into the market. Restraints for the non-dairy whipping agents market are present in particular types of non-dairy whipping agents, such as the one derived from palm oil. Worldwide, excessive deforestation due to increasing palm oil demand is leading to an environmental crisis, which is not sustainable in the long run. This can raise environmental concerns and can present itself as a probable restraint for the non-dairy whipping agents market. Developing countries have exhibited a pattern of increase in GDP recently. In proportion, the food industry in developing countries is thriving. One of the most notable of them is the bakery industry, which is the largest consumer of non-dairy whipping agents. The bakery industry often utilizes non-dairy whipping cream to provide bakery products with a smooth, fluffy, and desirable texture that appeals to consumers. The increasing demand for aerated food products is also shaping up as one of the most influential factors for non-dairy whipping agents. Studies have shown that, the consumption of aerated food increases the satiation level of the food product. This can be easily obtained by the incorporation of a non-dairy whipping agent in a food product. This has been a beneficial parameter for business owners in the bakery industry and home cooks, as well as retail consumers, and has contributed to the increased sales of non-dairy whipping agents. Region wise, the market in Europe is projected to dominate the global non-dairy whipping agents market through to 2026. Following Europe, North America is one of the most prominent markets non-dairy whipping agents. This is majorly attributed to the U.S., as the country holds more than ¾ of the market for non-dairy whipping agents in North America. The Middle East and Africa holds the lowest share in the global non-dairy whipping agents market, and presents moderate opportunities for growth, since the prevalence of leisure food products and desserts is mainly present in Gulf countries and partly in South Africa, while the rest of the countries in MEA hold a minuscule share of the market in terms of volume and value in the non-dairy whipping agents market.